Undoubtedly, the talk of the day on June 21 was not the bitcoin exchange rates, nor the political roller coaster of the fight against ISIS and oil prices. In fact, pretty much everyone was discussing the announcement made early in the morning by the Saudi Press Agency about events shaping the future of Saudi Arabia, and the region as a whole. The agency announced the decision of the Succession Committee which decided to promote Mohammed bin Salman to the position of crown prince. This means that after the death of King Salman, who is now in his 80s, the youngest of his sons will ascend to the throne. It would be an overstatement to say that this decision was unexpected by geopolitical experts across the globe. Ever since his ascension to the throne more that two years ago, King Salman and his youngest son have done everything to revise the rules of inheritance of the throne adopted under the now deceased King Abdullah, in accordance with which Mohammed bin Naif was to occupy the position of crown prince until the moment he would take the throne. Among the first steps towards this revision was the decision taken back in 2015 for Mohammed bin Salman to become deputy crown prince. To achieve this goal, King Salman had to relieve the former head of the General Intelligence Service from this position. There were rumors that Prince Mukrin received considerable compensation for agreeing to his resignation. However, one cannot describe Mohammed bin Salman’s road to absolute power from the moment when he became deputy crown prince as easy. After all, Mohammed bin Naif has always enjoyed massive support across the country. Additionally, he used to head the Ministry of Interior which was largely created by his father. If he decided there was power struggle, he could rely on the support of the Saudi armed forces, local tribes and influential Wahhabi clerics. However, due to the extensive amount of support that Muhammad bin Salman received from his father, he would soon head both the Ministry of Defense and the Committee on Socio-Economic Problems. He has reshuffled all the ministries and departments multiple times, sacking every single one of those civil servants that had a drop of royal blood in their veins, replacing them with faithful technocrats he summoned from business circles around the kingdom. Major changes were made to the pool of governors, while it’s safe to say that a balance of interests of various clans was preserved. All these steps resulted in the Succession Committee appointing Mohammed bin Salman crown prince, by relieving Mohammed bin Naif, who had to make an oath of allegiance to the new crown prince almost immediately after his resignation. One cannot script an event like this, no matter how creative one may be. This development is the result of both the gradual weakening of Mohammed bin Naif’s positions, along with a large number of behind-the-scenes deals that may never be disclosed. We are reduced to observations that one can make, like noting the fact that the brother of Mohammed bin Naif retained his post as governor of the Eastern Province, while his son, Prince Abdulaziz Bin Saud bin Nayef, has recently been appointed Interior Minister. This provides the Naif clan with the guarantees that it would still be playing some role in the political life of the country, but no more. But for how long? Thus, Mohammed bin Salman has received the unlimited power he has long sought. For the outside world, this means that from now on all the decisions that he’s taken should be perceived as the will of the future king. This notion has been confirmed by the changes that were introduced in the the Basic Law of the kingdom, according to which the grandsons of the King-founder are now allowed to ascend to the throne. 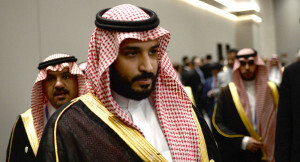 And there’s little doubt that the Yemeni conflict, which Mohammed bin Salman effectively started two years ago will be a major headache for the powerful crown prince who sought to teach Iran a lesson but didn’t comprehend the price of the conflict beforehand. It will be extremely difficult for him to get out of this military adventure, especially against the backdrop of the recent split in the Cooperation Council of the Arab States of the Persian Gulf (GCC) due to Qatar’s policy, which actually led to the collapse of the anti-Houthis coalition. Even between the closest allies within this coalition one can still find serious disagreements. The crown prince can reach a compromise with the largest Yemeni tribes at the expense of his pride, but he’s got to get out of Yemen one way or another. In other words, the world received a new leader at the head of Saudi Arabia, even though he’s formally just a successor to the throne. We see a young, energetic reformer, that wants to turn Saudi Arabia into a new Dubai. However, on the path to his success he’s not just going to struggle with the traditional inertia of Saudi society, but a long list of contradictions with Iran, the GCC states and Yemen. The risks that the kingdom is facing are extremely high – rapid reforms can tear Saudi society apart, while the absence of them could mean the end of any financial reserves Saudi Arabia still has left against the backdrop of low oil prices. Mohammed bin Salman must also find an approach to the United States, China and Russia. The desire to diversify ties and refuse to rely solely on the US has always been his intention. Only how he will achieve this balance remains unclear. We may get our answers when King Salman makes his first historic visit to Russia.